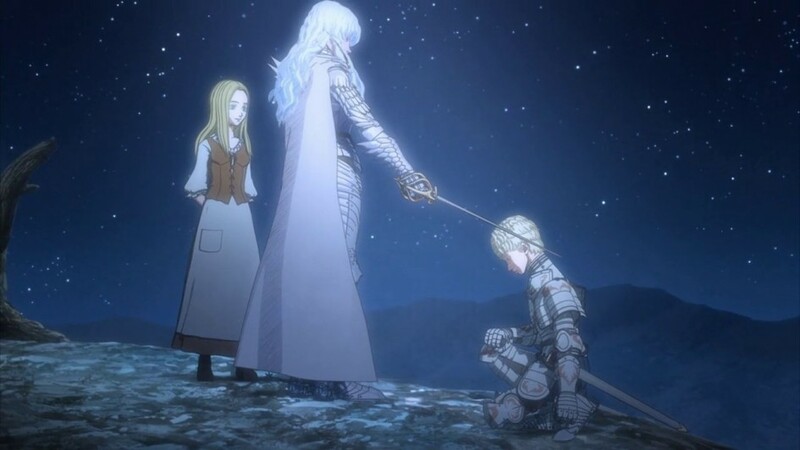 It’s recruiting time on Berserk, and whether his heart is truly free or not, Griffith is doing a much better job at attracting useful companions to his new Band of the Hawk (how dare he!) than Guts’ fellowship of lost souls and comic relief characters. Flocking to the White Hawk’s re-hoisted banner are a selection of assorted legendary heroes from all the required classes, ready to showcase their impressive talents at inflicting almost comical amounts of carnage on the Kushan invaders of Midland. While the demon army’s allegiance begs the question of why liberating Midland would be on their agenda, we also learn more about some of Griffith’s human followers: Sonia, a young seer sitting somewhere on the sliding scale of innocent hero worship and psychotic dedication, and Mule Wolflame, a refreshingly upstanding Midland noble whose healthy mix of gratitude and doubt evaporates when he finds himself offering his sword to Griffith, overwhelmed by tears without knowing why. Check out my full review of Berserk 2017, episode 15 over at ANN.